Consumer Lifestyles Reviews - Legit or Scam? Consumer Lifestyles Reviews – Legit or Scam? 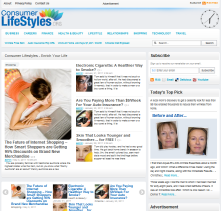 Consumer Lifestyles, found at ConsumerLifestyles.org, claims to be an “all in one consumer website” that is the “world leader” in giving their visitors resources intended to “enhance and improve” your life. ConsumerLifestyles.org says they provide information for their readers concerning the best companies for auto insurance, tech products, travel assistance, homeowner insurance, career guidance, financial assistance, health and beauty, and more. And according to their website, the articles are written for the purposes of education and information, as well as to empower their readers to be in better control of their lives by making the right consumer decisions. Consumer Lifestyles actually specializes in advertorials, which is a specific kind of editorial style article that is intended to appear neutral and information, but is in reality a paid advertisement. Advertorials are a controversial form of advertisement, because they purposely attempt to appear as though they are not an advertisement, which many people find rightfully confusing. In addition, once you give your information to Consumer Lifestyles, it will automatically be given to their partners and affiliates so they may contact you with special offers and information. However, they do promise that your information will never be sold to a third party company. Finally, the articles posted on ConsumerLifestyles.org are actually quite confusing, as the article represents one specific company, but the link will take you to a completely different company. For example, the article about using penny auctions is advertising DealFun, but will connect you to ZBiddy. This type of error is confusing to the consumer, and leads to doubts about the “excellence” of the articles and the “vetting” of their products. All consumers who take the advice of paid advertisers should make sure to do their own independent research before investing money in a company or product. Average Rating for " Consumer Lifestyles " is 1 out of 5 based on 1 reviews. Do not purchase from the website. It is a rip off. The 1st offer for Garcinia Cambogia is 159.00 for 3 bottles and 2 free. If you decided not to purchase and close the site a window pops up offering 20% off the 159.00 making it 99.99. However, when I got my email receipt they charged 159.00. I call the customer service line and the guy I spoke with said they would correct it. The next day nothing was corrected and if you call the customer service line again they explain to you how you misunderstood the offer. If you get Mary she is a total B*t*h. I wish I never called these a**holes and I will never again. I have a snap shot of the site offer / total and they still agrued it. I got my first e-mail from these schmucks supposedly thru my fiance. nope, he did not send me this information as he doesn't believe in half their crap anyway. I continue to get e-mails and continue to look for a way without a WTF phonecall to whomever is sending me this crap.